InstaLift is the first minimally invasive method for lifting and repositioning the subdermal (underlying) tissue of the face. This 21stcentury facelift without surgery increases and restores volume to the mid-face and cheek area for a natural looking, more youthful appearance. The outcome is immediate, with results getting better over time. InstaLift is a minimally-invasive, resorbable suspension suture with bi-directional cones. InstaLift sutures are made from glycolide / L-lactide (PLGA), a polymer that is frequently used in medical devices and is well tolerated by the body. The fully resorbable sutures have bi- directional cones; the sutures lift and reposition the tissue while the bi-directional cones hold the suture and facial skin in an elevated position. 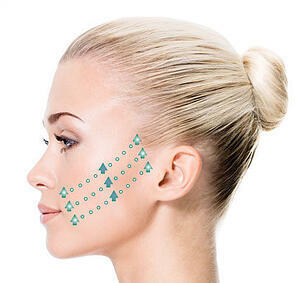 During the procedure, a specially-trained physician will begin by marking the areas of desired lift on the patient. He / she will then gently insert a needle to a depth of 5mm and guide it through the subcutaneous tissue and extract at each bi-directional exit point. The sutures have bi-directional absorbable cones that hold them in place. The treatment is generally well tolerated by patients and typically takes 45 minutes. Q. Is InstaLift FDA cleared? Q. Who is a good candidate to have InstaLift procedure? InstaLift is the ideal minimally-invasive solution for many men and women who are interested in refreshing their appearance without major surgery, injections, or lasers. It offers a new and unique technology to lift sagging facial skin. Suitable candidates have good skin quality, with moderate sagging of the skin in the mid-face. Q. What can InstaLift do to improve my appearance? Sagging facial skin is one of the major contributors to an aged and tired appearance. InstaLift is a minimally-invasive procedure that redefines the contours of your mid-face by lifting the deeper layers of your skin for a more youthful look. Q.What areas of the face does InstaLift treat? No. Your physician will only use a local anesthetic to numb the area before inserting the sutures.appearing to have very thin soft tissue of the face in which the implant may be palpable. Q. What are the side effects that might happen with this procedure? After placement, patients may experience a minimal acute inflammatory tissue reaction. Symptoms may include minor pain, swelling and bruising.